Pasta di Piazza is the perfect place to enjoy a true Italian meal. Brand new and recently opened in December 2015, Pasta di Piazza in Acocks Green, Birmingham is the new venture owned and operated by Gaz and Fred, the best restaurateurs that we know. This is one of those jobs that we just couldn't turn down. 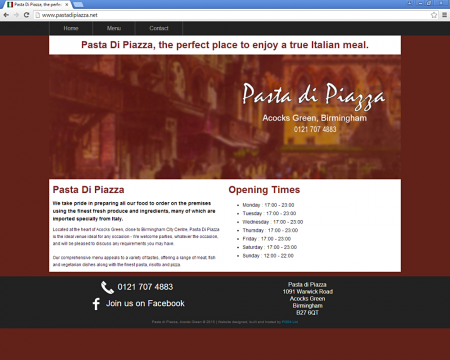 Having frequented the Pasta di Piazza in Stone, Staffordshire, for the last ten years, we were delighted to be asked to help Gaz and Fred with their new site in Acocks Green, Birmingham. They had so much on their plates that they were happy to leave the website to us and so the design and functionality is completely in-house; a PG54 original. As and when time allows, we will be expanding the site to include photos and customer feedback but, for now, it does fulfil the three key points of "Who Are We? ", "Where Are We?" and "What Do We Do?"